No town takes grilled cheese more seriously than Madison, Wisconsin. Madison is also home to the University of Wisconsin Madison (UW), where the first reliable butterfat content milk test was developed in 1890. To support the research conducted in UW’s Food Science department, the college sells cheese and ice cream at the Babcock Hall Dairy Store on campus. You can take a free guided tour of the dairy plant and buy a $2 bowl of ice cream afterwards. During the school year, Madison’s population swells by 30,000 hungry college students. This influx of youthful vitality (and metabolism) contributes to Madison’s foodie culture. April is National Cheese Month in the U.S.A., but the classic sandwich has global reach. In Middle Eastern countries such as Lebanon and Turkey, grilled cheese has always been an elemental ingredient in flatbreads. In Europe, the grilled cheese sandwich first showed up in France in 1910 as the Croque Monsieur—a.k.a.Mr. Crunch—which involves baking cheese on top and inside the bread, accompanied by boiled ham. In the United Kingdom,Welsh Rarebit layers melted cheese on one piece of dark bread; the cheese is often flavored with Worcestershire sauce. In Italy, every cheese shop sells the panini: focaccia bread grilled between a sizzling press until the cheese oozes out. The quesadilla is Latin America’s spin on grilled cheese, melting Oaxaca cheese inside a tortilla. Although grilled cheese sandwiches are relatively easy to make at home, some dining venues have elevated them to star status. That’s particularly true in Madison, where long-established restaurants feature a grilled cheese sandwich that makes foodies swoon. 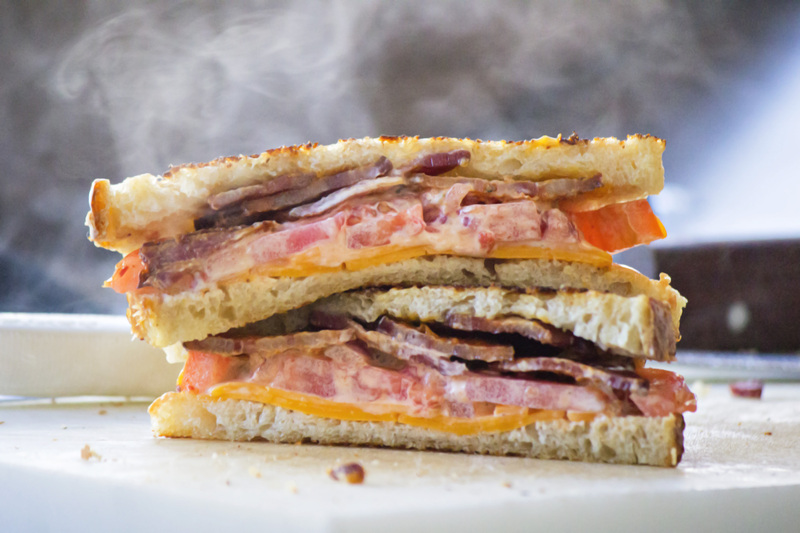 The Old Fashioned uses a combination of aged cheddar and Swiss cheese, then adds Bavarian hickory-smoked bacon on two slices of Texas Toast. 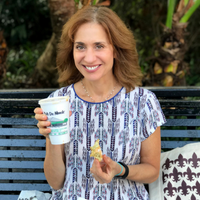 “It’s the best grilled cheese I’ve ever had,” says Sue Reddel, co-founder and editor of FoodTravelist.com. “In the summer, The Old Fashioned adds an heirloom tomato. 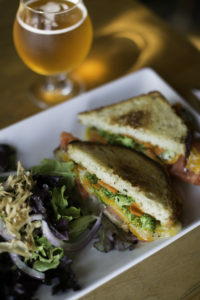 They only serve this sandwich when tomatoes are fresh and local,”Reddel adds. For the remainder of the year, The Old Fashioned substitutes roasted red peppers. You might call Anna Shircela grilled cheese expert. As public relations coordinator for Destination Madison, she has sampled many of the city’s premier cheese sandwiches. “I’m obsessed with the Alchemy’s Stuffed Grilled Cheese. They take roasted broccoli, carrots, tomato and red onion, then mix the veggies into a sublime concoction of cheddar and Swiss cheese. They also spread cilantro pesto sauce on the sourdough bread. Alchemy sources cheese from Madison’s Sassy Cow Creamery. Another of Shircel’s favorites is from the Tipsy Cow Madison “I love their Bacon Guacamole Grilled Cheese sandwich on sourdough bread,” she says. “They use Nueske’s smoked bacon, three-year-old Wisconsin cheddar cheese plus house-made guacamole.” The Tipsy Cow, located off Capital Square near Wisconsin’ State Capitol,offers a wide selection of craft beers. On-the-go college students and politicos find food trucks a popular source of sustenance. One of the town’s favorites is Melted, the Cadillac of grilled cheese. Melted rotates what’s on the griddle each week, but highlights include The Caprese, grilled mozzarella cheese sandwiches with pesto and tomatoes; as well as The Gold Standard with tiers of sharp cheddar, muenster, Swiss and bacon. Look for Melted on at the Dane County Farmers’ Market. 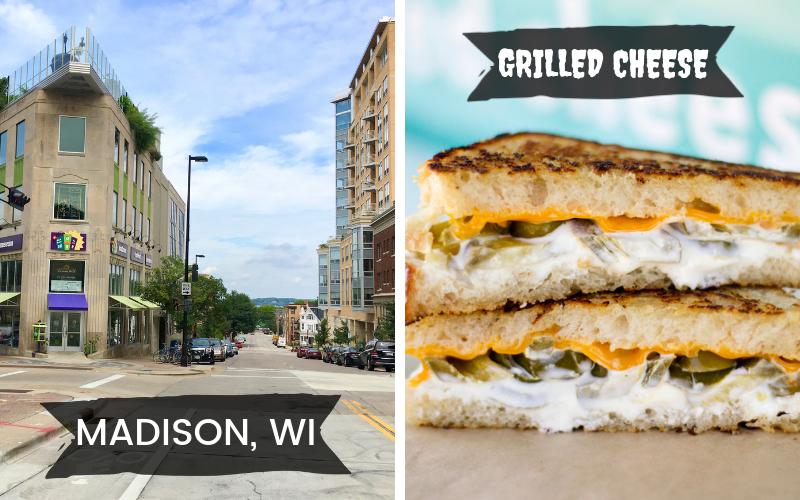 Lofty grilled cheese-making is one great reason to visit Madison, but scroll down to “Plan A Trip…” section to peruse a list of a lot more. The perfect souvenir? A Wisconsin cheese-head hat! Cow, sheep and goat milk cheeses are different in flavor and chemical makeup. According to ModernFarmer.com cow, sheep, yak and goat cheese are made by coagulating the solids in milk, separating those solids (curds) from the liquids (whey), and then aging it. All cheese has lactose and is not a complex carbohydrate. Because it’s structurally sound and consistent, cow’s milk is typically used for cheese recipes that add peppers, seasoning or dried fruit. Cow’s milk is strong and stretchy so is used to make mozzarella. Many soft ripened cheeses, like brie, are made with cow’s milk. Fat molecules in cow’s milk are larger, which is why some people with lactose intolerance find it harder to digest than goat’s and sheep’s milk cheeses. Cheddar is a popular cow’s milk cheese. The structure of fats and proteins are not as consistent in sheep’s milk, which makes a sheep cheese less predictable, and often a little saltier: for example, sheep’s milk feta is generally saltier than cow’s milk feta. Sheep’s milk cheese has the highest amount of butterfat, so its cheese tend to taste buttery and rich. Sheep’s milk cheese is typically semi-firm, nutty and oily. Manchego and Pecorino Toscano are popular varieties. Goat cheese is often described as tangy or sour and has a higher concentration of particular fatty acids and less protein than cow’s milk. Kefir orchèvre, popular goat’s milk cheeses, boast a tangy bitterness. Goat’s milk is even more unstable and varied in formula than sheep’s milk. This instability affects the aging time. It often crumbles apart, because it doesn’t have much moisture. Because the fat molecules in goat’s milk are small, it’s the easiest to digest of the three. When in Madison on a Saturday morning, do not miss the Dane County Farmers’ Market where you can buy local products and sample a cornucopia of cheeses,including some iconic Wisconsin cheese curds. Enjoy the scenic Lakes Monona and Mendota for a variety of recreational activities, from ice fishing to pontoon boating to paddle boarding. In good weather, rent a bike and pedal the peaceful lakefront trails. Peruse Madison’s famous State Street for eclectic shopping and dining. Visit the Chazen Museum of Art, a free art museum with an astounding collection of contemporary art in a variety of media. Madison Children’s Museum has an interactive art studio,log cabin,a giant Gerbil Wheel that kids can actually run in, and a lovely urban garden. Frank Lloyd Wright fans should tour Monona Terrace and Convention Center. The renowned American architect was born in Spring Green, a village about a half-hour from Madison. Late in Wright’s life, he was commissioned to design this unusual building with its dramatic open spaces and rooftop terrace. From the rooftop, you can enjoy one of Madison’s dramatic sunsets and get a bird’s eye view of the Capitol Dome. 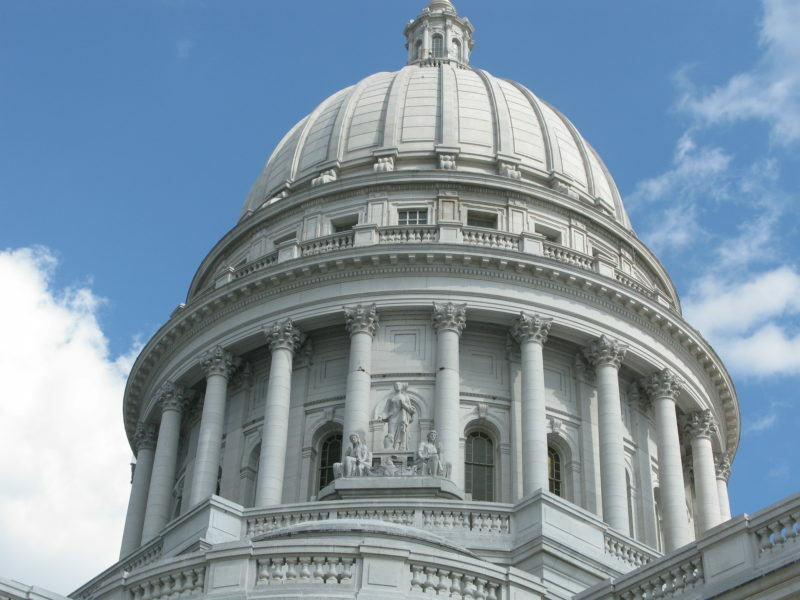 Signup for a tour or just wander through the Wisconsin State Capitol with its majestic Capitol dome that reaches 200-feet; it’s a replica of the U.S. Capitol in Washington DC. While you’re there, keep an eye out for badgers, University of Wisconsin’s beloved mascot. This wily critter shows up on door handles, murals and even on the head of the statue that tops the Capitol Dome. The Edgewater is Madison’s only AAA Four Diamond hotel. 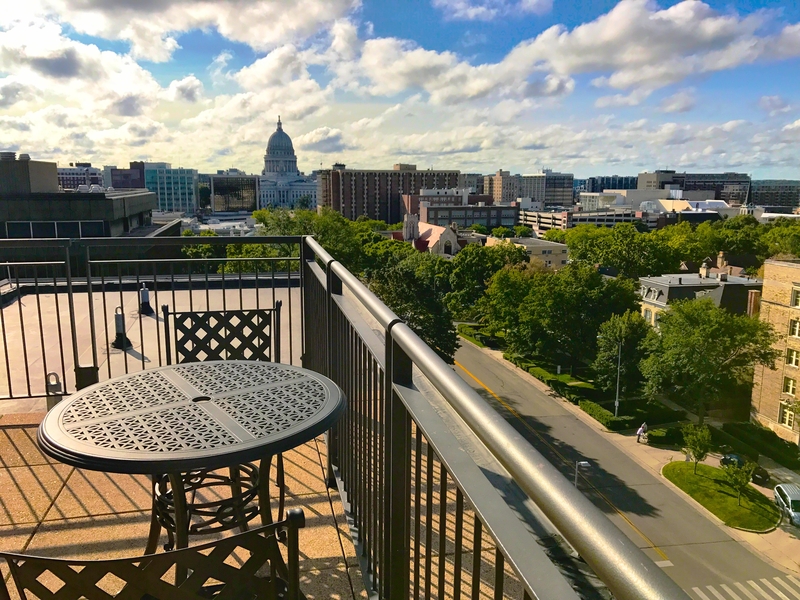 Located on Lake Mendota, the views are spectacular from every room. Take in the multi-hued sunset from theterrace, restaurants or marina. The Statehouse is perfect for a special occasion, and if you have time, schedule a spa treatment or take a spin on its festive ice rink. Hilton Madison Monona Terrace is located on Lake Monona, next to the Monona Terrace Community and Convention Center. This luxurious hotel has beautiful lake views, sumptuous and expansive rooms, and a soothing indoor pool. Love grilled cheese? Check out these grilled cheese-themed festivals! Renee Sklarew writes Travel & Dish.